Fall is my favorite season. Halloween runs a close second to Christmas for my favorite holiday, and I absolutely adore the soundtrack to Tim Burton's The Nightmare Before Christmas. Costumes, magic, a little spookiness, a chance to be someone else for a night? I'm so there! So the question wasn't 'do I want to work with a Halloween theme' for my Freeform Peyote Rings workshop at Fusion Beads earlier this month, but rather "what Halloween theme do I want to play with?" My first thought was Disney villains - a ring for Maleficent or Cruella Deville perhaps? I could see a fiery crimson red jewel for Malificent, while Ms. Deville's would have to be in her iconic monochrome black and white. Or maybe a witch's ring? What would I do for that? 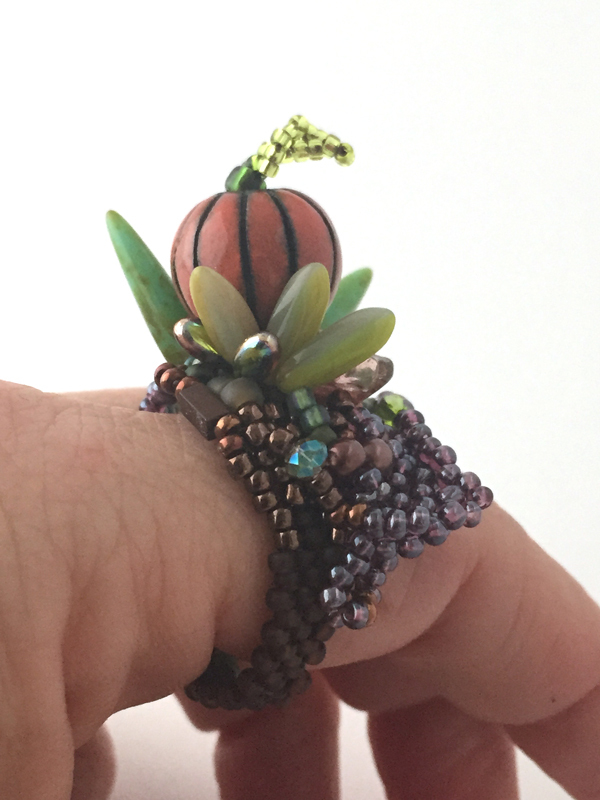 Instead, I opted to make myself a pumpkin patch ring. Jack Skellington might be the Pumpkin King, but I could wear a Pumpkin Ring! A magic pumpkin ring, wouldn't that be fun? I'm sure I need a magic pumpkin ring. I ended up making two rings. 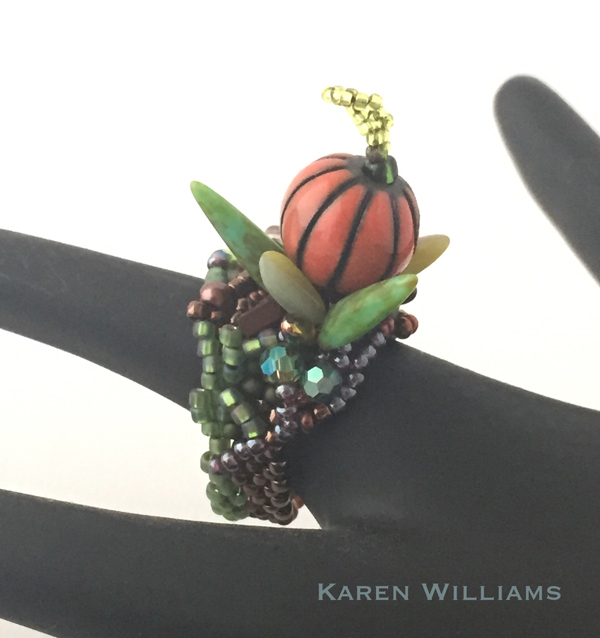 The first is a little more subdued, with a 15mm round carnelian stone that doesn't immediately scream 'pumpkin', but definitely plays to the autumnal theme with its muted color tones. The little pressed-glass flower reminded me of pumpkin blossoms, so I decided to add it, but liked the violet color better than yellow. So now I have a purple pumpkin blossom. Let's hear it for creative license. 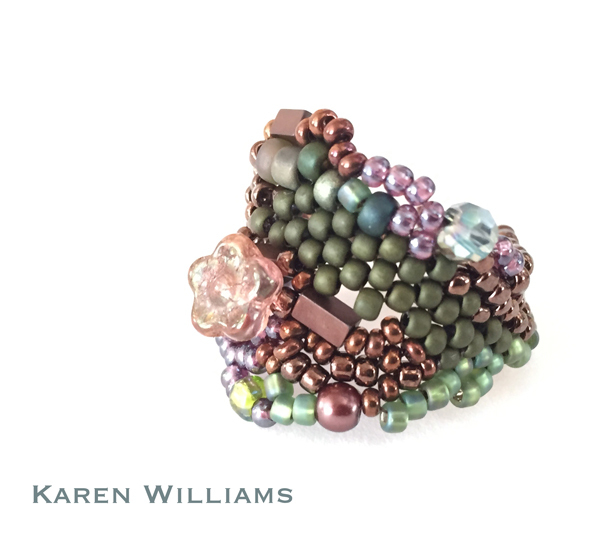 It also let me demonstrate the stages of work when adding the focal bead from the very beginning. 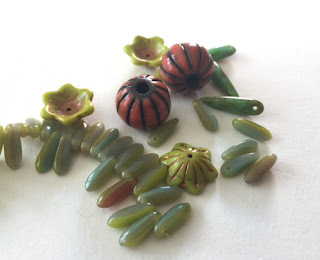 Perusing Fusion Bead's selections before class, I came across these fantastic orange and blackish-brown enameled beads. I don't think they were originally designed as pumpkins, but aren't they perfect? 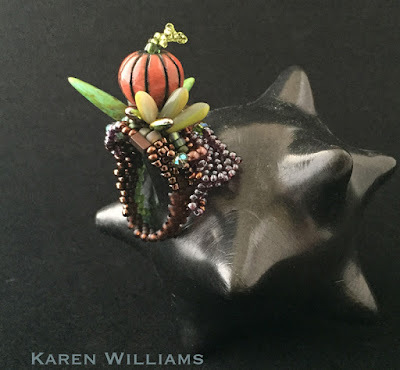 I thought the apple-green & coppery-orange flowers might work as pumpkin blossoms and or a pumpkin cap. While I was at it, I picked up a couple of different strands of daggers and spiky fringe beads, too. 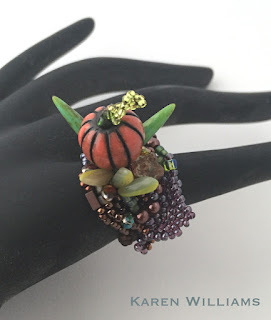 For this ring, I wanted the pumpkin to sit atop its 'field' at a jaunty angle, surrounded by vines. 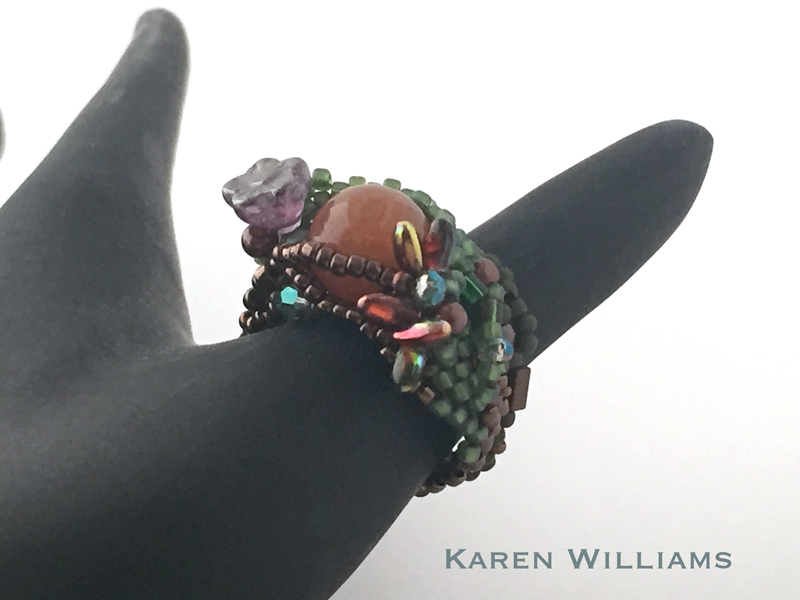 A lot of the fun with freeform peyote rings is allowing yourself to go over the top. With that in mind, it was time to embellish. Those rings are FUN! They are certain to bring smiles to everyone. Omigosh, those are too cute! !